While completing a Phase I Environmental Site Assessment (ESA), addressing vapor intrusion of hazardous substances is required. All standards, ASTM E1527-13 and EPA AAI, and the SBA SOP 50 10 5(J) require that you address the presence or likely presence (potential) for vapor intrusion (migration) of hazardous materials (a recognized environmental condition) onto the subject property or within the subject building(s). The most common hazardous materials related to vapor intrusion (migration) are Volatile Organic Compounds (VOCs). 3.2.78 recognized environmental conditions—the presence or likely presence of any hazardous substances or petroleum products in, on, or at a property: (1) due to release to the environment; (2) under conditions indicative of a release to the environment; or (3) under conditions that pose a material threat of a future release to the environment. for example, solid and liquid at the surface or subsurface, and vapor in the subsurface. See Note 4. NOTE 4—Vapor migration in the subsurface is described in Guide E2600; however, nothing in this practice should be construed to require application of the Guide E2600 standard to achieve compliance with all appropriate inquiries. In Summary, NOTE 4 above basically says there is no requirement to prepare a separate report and/or modeling as a part of the all appropriate inquiry of a Phase I ESA. Does vapor intrusion need to be addressed? Yes, just as any potential recognized environmental condition (REC) needs to be addressed. Below I will point out how to use the ERS RecCheck Report (radius search) to assist in identifying any vapor intrusion RECs. Prudent lending practices dictate that specific additional environmental assessments be performed for certain special use facilities. For example, Property constructed prior to 1980 that will be used for daycare or child care centers or nursery schools or residential care facilities occupied by children must undergo a lead risk assessment (for lead based paint) and testing for lead in drinking water, and the results of these assessments must be submitted to the SBA. Disbursement will not be authorized unless the risk of lead exposure to infants and small children has been sufficiently minimized. On-site dry-cleaning facilities, which may have utilized chlorinated solvents such as tetrachloroethene (PCE) and trichloroethene (TCE) and/or petroleum-based solvents in the course of their business operations, may present significant clean-up costs if these contaminants have entered the soil, soil vapor and/or groundwater. Prudent lending practices dictate and SBA requires that any Property with on-site dry-cleaning facilities, whether currently in operation or operated historically at the site, that did, do or likely used chlorinated and/or petroleum-based solvents undergo a Phase II Environmental Site Assessment in addition to a Phase I which would be required due to the NAICS code match. What is a typical Volatile Organic Compound? The definition of Volatile organic compounds, or VOCs are organic chemical compounds whose composition makes it possible for them to evaporate under normal indoor atmospheric conditions of temperature and pressure. This is the general definition of VOCs that is used in the scientific literature and is consistent with the definition used for indoor air quality. REF: NYSDOH CEH BEEI Soil Vapor Intrusion Guidance October 2006. As can be seen above, there are numerous industries and uses of VOC’s that can create a vapor intrusion likely presence scenario (REC). Hence the list of NAICS codes used by the SBA in the SOP 50 10 5(J) provide a list of industries (environmentally sensitive) that should be looked at for vapor intrusion. While soil vapor intrusion can also occur with “naturally-occurring” subsurface gases (e.g., radon, methane and hydrogen sulfide), most identified soil vapor intrusion is in terms of environmental contamination. However, vapor intrusion can also occur through direct volatilization of contaminants from groundwater into indoor air. This can occur when, for example, a basement slab is in contact with contaminated groundwater, contaminated groundwater enters (floods) a basement or crawl space, or contaminated groundwater enters a sump pit drainage system. The phrase “soil vapor intrusion” refers to the process by which volatile chemicals migrate from a subsurface source into the indoor air of buildings and/or onto property. Soil vapor, also referred to as soil gas, is the air found in the pore spaces between soil particles. Primarily because of a difference between interior and exterior pressures, soil vapor can enter a building through cracks or perforations in slabs or basement floors and walls, and through openings around sump pumps or where pipes and electrical wires go through the foundation. For example, heating, ventilation or air-conditioning (HVAC) systems and/or the operation of large mechanical appliances (e.g., exhaust fans, dryers, etc.) may create a negative pressure that can draw soil vapor into the building. This intrusion is similar to how radon gas enters buildings, Soil vapor can become contaminated when chemicals evaporate from subsurface sources. 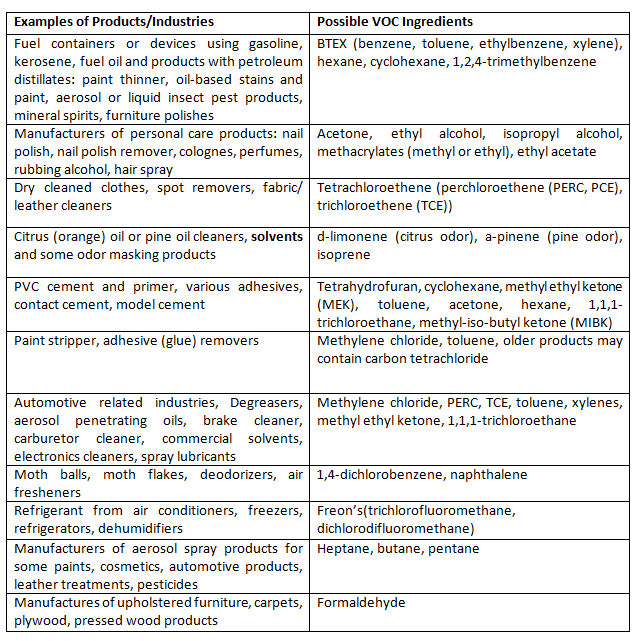 Chemicals that can emit vapors are called “volatile chemicals.” Volatile chemicals include volatile organic compounds (VOCs), some semi-volatile organic compounds (SVOCs), which are not common, and some inorganic substances such as elemental mercury. Subsurface sources of volatile chemicals can include the following: a. groundwater or soil that contains volatile chemicals; b. non-aqueous phase liquid (NAPL); c. buried wastes; and d. underground storage tanks or drums. If soil vapor is contaminated and enters a building, indoor air quality may be affected. When contaminated vapors are present in the zone directly next to or under the foundation of a building, vapor intrusion is possible. Soil vapor can enter a building whether the building is old or new, or whether it is on a slab or has a crawl space or basement. However, the subsurface source of the contaminated vapor (e.g., contaminated soil or groundwater) does not need to be directly beneath a structure to contaminate the vapor immediately beneath the building’s foundation. 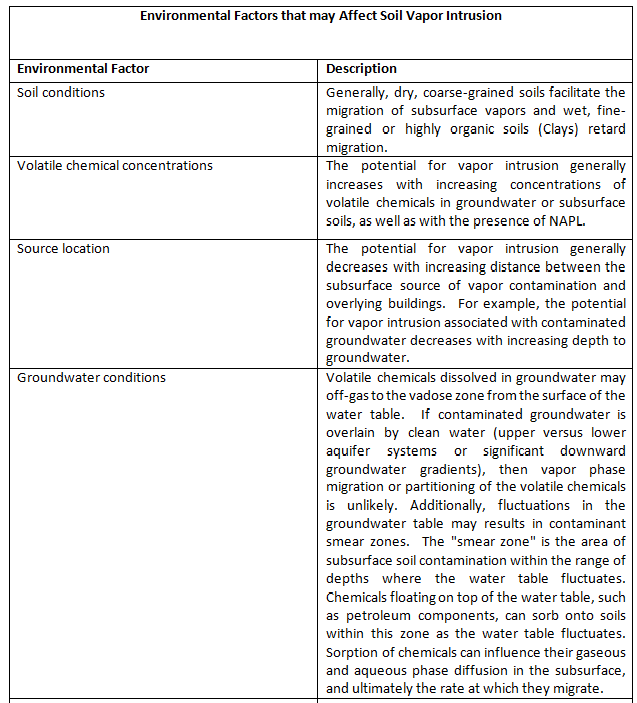 What are some of the Environmental factors that may affect soil vapor intrusion? Therefore, knowing your site geologic and lithology conditions is important in evaluating the possibility of vapor intrusion from offsite sources. In most cases as long as the potential contaminate is not immediately adjacent or connected to the same slab or foundation of your subject site building(s) and the groundwater isn’t very shallow, vapor intrusion is unlikely. The above is just some of the information needed to help determine if a vapor intrusion issue potentially or exists at the subject site. Let’s break down what we have learned and put it in terms for quick review. Why and what regulations dictate that we have to address the potential for vapor intrusion(REC). You are not required or need to order a separate Vapor Intrusion report and/or conduct any sampling what-so-ever for a compliant Phase I ESA. To comply with ALL Phase I ESA standards, you only need to identify if there is a potential vapor intrusion of hazardous materials REC. Buying a vapor intrusion report and/or running a modeling program is a waste of resources. Furthermore, the companies that provide these reports and modeling programs do not stand behind them at all. Read their respective terms and conditions, liability and limitations statements carefully. What is a VOC and what is vapor intrusion. What chemicals, products and industries could be a concern for vapor intrusion. What role does local and site environmental factors play in your decision. Mark and/or write all comments from the field inspection on a specifically designed field checklist in the field with photos. This allows the viewer to exactly see what the inspector viewed. Sample checklists for various industries is provided for free by ERS to its clients. The report writer (Environmental Professional (EP)) can easily review the ERS RecCheck report (Radius Search) for incidents, usage, LUSTS, etc. (ERS presents webinars to show how to get around the RecCheck report quickly and efficiently) for VOC contamination on the subject site and/or adjacent sites. The report writer (EP) can easily review the history of adjacent sites and the subject site to identify any of the industries listed above that may cause a possible vapor intrusion of hazardous materials scenario. 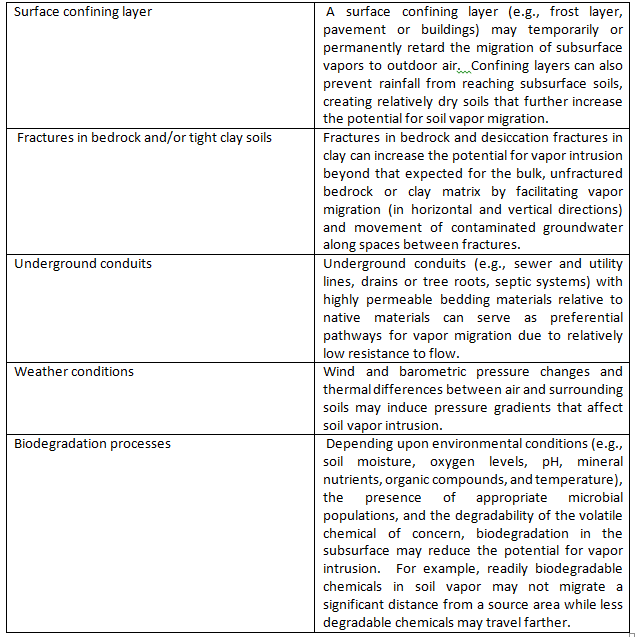 The geologic and lithologic section of the RecCheck report spells out the main subsurface environmental factors for the subject site and immediate area. The Air Permit potential dispersion map shows site(s) that use VOC’s thereby, use hazardous materials that are known to cause vapor intrusion concerns. Review thoroughly and integrate these listings into your Phase I ESA. If you order a package (RecCheck report, Air Permit Dispersion Map and Historical) from ERS, you do not need to spend money on additional vapor intrusion screening, reports, modeling, and evaluations (these are not required by ANY standard in a Phase I ESA). Anything other than these items integrated into a Phase I ESA should ALL be done in a Phase II. By using a complete field checklist and a comprehensive report writing template (all provided by ERS for free to our clients), you can ensure that you address any and all possible vapor intrusion of hazardous materials in your Phase I ESAs. Having your Eps and Site Inspectors attend our FREE webinars will allow them to learn how ERS’s reports save its users time and money while still maintaining a high quality and thorough Phase I ESA. ERS stands behind all its data and reports with actual environmental errors and omissions or professional liability insurance up to its insurance limits of $2 million, unlike our competitors. Have confidence in your database company and use ERS Environmental Record Search. Contact us for a step-by-step guide on addressing Vapor Intrusion in your Phase I without added vapor reports or sampling. ←Putting Your Environmental Due Diligence Needs First with Unbeatable Benefits You Can ONLY GET WITH ERS! !